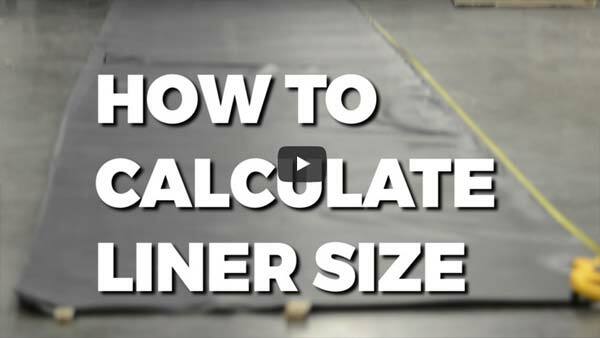 How To: Measure your Pond Liner To begin, you'll need 3 measurements. Length, width and depth. These will be the longest length, the widest width and the very deepest depth. No averages, and these measurements will always be taken in feet. To begin, you'll need 3 measurements. Length, width and depth. These will be the longest length, the widest width and the very deepest depth. No averages, and these measurements will always be taken in feet. First, you'll multiply the depth times 2. Because, basically you're going down twice on both sides. Now we'll add overhang. I generally like to add a foot to both sides. So, we will add 2. One foot for each side. If you wanted 6 inches to each side, you would only add one. To reiterate, depth times 2, plus overhang (2). We'll then take that number and simply add it to our initial length, for the final liner length. And the same for the width, to achieve our final liner width. First, take the depth, 1.5. Multiply times 2, you get 3. 3 plus 2, one foot of overhang on each side, and that gives us 5. Then, add 5 to the length, 15. And add 5 to the width, 15. Our final dimensions are 15 x 15. So, for a 10 x 10 x 1.5 pond a 15 x 15 liner is required.